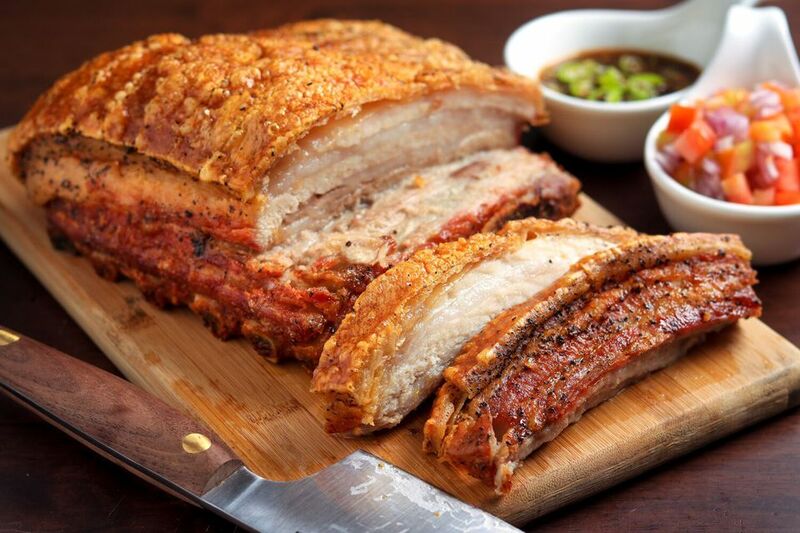 This roasted pork belly is simple and delicious, with just basic seasonings. The long, slow roasting makes for tender meat. The oven temperature is increased near the end of the cooking time for the crispy skin. Make this pork belly to go with beans, black-eyed peas, scalloped potatoes, or mac and cheese. With a sharp knife, make several parallel cuts across the skin of the pork belly. Cut through the skin and fat but not into the meat. Place the cuts about 1/4-inch apart. Rub the pork all over with kosher salt and freshly ground black pepper. Drizzle with olive oil and rub that in. Place the pork on a rack in a baking pan, skin side up. Roast for 2 to 2 1/2 hours, or until the meat is very tender and falling apart. Increase the heat to 425 F and roast for about 20 minutes longer to crisp the skin more. Remove and let rest for 10 minutes before slicing. Slice thinly, using the cuts in the skin as guides. Allow the pork belly to sit in the fridge, uncovered, for about 4 hours before you plan to cook it. This will allow the skin to dry out and result it a crispier crackling. Make sure that the pork is cold when you score it. This will make it easier to cut.